You are readingZero Gravity Hammock Makes You Go Just WOW! Zero Gravity Hammock Makes You Go Just WOW! Lying tension-free out in the open is the first thing that comes to your mind on a sunny Sunday, right? And now, with this Zero Gravity hammock, you can have the best comfort, making sure that your neighbor is burning with envy. Unlike any hammock that you may have experienced, this hammock has a generous amount of contoured padding, making sure that every curve of your body is comfortably cradled. The weather resistant, quilted pillow top hammock sports ergonomics that promises to provide the best comfort to your head, neck, back, and hip joints and give you with the best relaxation experience. 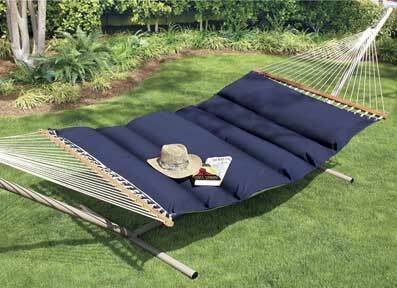 The 55 inches wide hammock in navy blue is a biggie and has enough space for two to sleep soothingly. Now, you can finally bid adieu to all the pesky fights you had with your partner so as see who gets to sleep the most on the hammock. Also, the top cloth is a pretty decent one and “breathes” so that you don’t sweat while you sleep on it, and the skin remains cool. All in all a nice piece of novelty, this thingie makes up for a good gift for your parents or siblings. Priced at about $299.99 , I definitely won’t call this thing dirt cheap, but looking at the plus points, I also won’t mind digging a small hole in my pocket for it. And if you are rich guy, you might also wanna spend a few extra bucks to buy the accessory hammock stand. Other cool stuff that you might like to see are a list of a few weird bottle openers and a cool new headphone for the deaf!